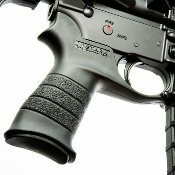 STARK ONE AR Rifle Grip - An innovative solution that delivers maximum weapon control to the shooter. This grip reduces fatigue, while helping the shooter maintain a solid shooting platform. The angle of the grip is more natural for your hands, closer to a 90-degree angle. This allows the shooter's arms to stay tighter to the body with the wrist straighter. The hand stop, located at the upper back strap, locks the hand in at the same position with the index finger aligned to the trigger at the same angle every time for consistent shot placement. Stark has incorporated an integral trigger guard which is smooth and oversized for use with gloves. The grip has a secure storage space for various sized batteries. Each crucial point of shooter-to-weapon contact has been carefully thought out, tested by professionals and optimized. All Stark Grips are constructed of a durable, textured material for a reliable grip when it counts. Professionals and hunters alike will appreciate its unique design, no matter the environment or mission. The geometry of the STARK ONE grip reflects the current technical demand for functionality and endurance. The STARK ONE fits all standard AR-15 / M-16 / M-4 carbines and Rifles. The STARK ONE AR Rifle Grip With optional Sling Mount is the first and only AR-15 pistol grip to integrate an ambidextrous sling mount. The Sling Mount is available in two versions: The Hook Mount provides a loop for attaching most common sling hooks and the Swivel Mount allows the attachment of push button detachable sling swivels. The Sling mount is positioned above the hand and below the stock, out of the way of fully collapsed stocks. Povides excellent one-handed control when added to AR pistols. Extensive strength testing has been performed on the STARK ONE AR Rifle Grip With Sling mount to ensure a reliable attachment point that you can depend on. NEITHER HOOKS OR SWIVELS ARE INCLUDED WITH THE STARKONE AR RIfle Grip With Sling Mount. Please be sure of the type of attachment on your sling. Note: The standard trigger guard must be completely removed to install the STARK ONE AR RIfle Grip.